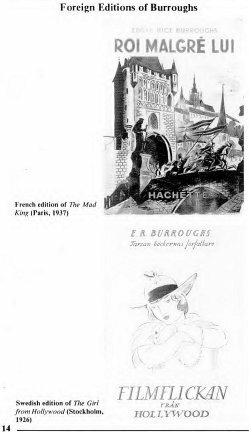 Burroughs had a musical flair for creating fictitious names, and any stylistic account (no matter how brief) would be abortive were it not to include examples. He often bracketed a phonetic spelling of names to give his readers a clear idea of their pronunciation. His exotic heroines were frequently given names which included a soft "j" (pronounced as the "z" in "azure"), while his ever present "bad guys" usually had short gutteral names ending in a voiceless fricative. The sonorous quality of his nomenclature drew heavily on the pure Italianate vowels of the Romance Language group. 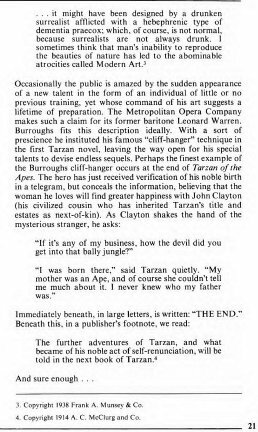 In combination with his irrepressible humor, the results are delightful ... as in the case of his tenth Tarzan novel: Tarzan and the Ant Men. Here, the diminutive characters are given pretentiously long cognomens. The young prince "Komodoflorensal" is rescued by Tarzan from the clutches of the despot "Elkomoelhago" as the "Trohanadalmakusians" and "Veltopismakusians" (hereditary enemies) slug it out. The names are as memorable as they are tongue-in-cheek! 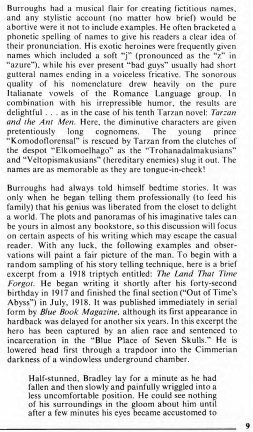 Burroughs had always told himself bedtime stories. It was only when he began telling them professionally (to feed his family) that his genius was liberated from the closet to delight a world. The plots and panoramas of his imaginative tales can be yours in almost any bookstore, so this discussion will focus on certain aspects of his writing which may escape the casual reader. With any luck, the following examples and observations will paint a fair picture of the man. 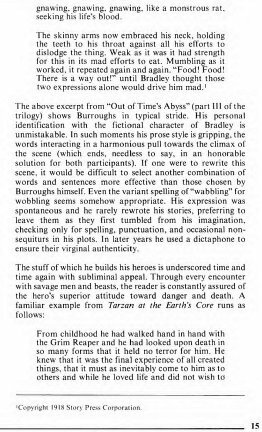 To begin with a random sampling of his story telling technique, here is a brief excerpt from a 1918 triptych entitled: The Land That Time Forgot. He began writing it shortly after his forty-second birthday in 1917 and finished the final section ("Out of Time's Abyss") in July, 1918. 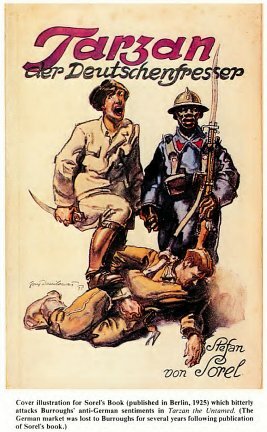 It was published immediately in serial form by Blue Book Magazine, although its first appearance in hardback was delayed for another six years. In this excerpt the hero has been captured by an alien race and sentenced to incarceration in the "Blue Place of Seven Skulls." He is lowered head first through a trapdoor into the Cimmerian darkness of a windowless underground chamber. the dark interior when he rolled them from side to side in survey of his prison. Almost immediately he had taken his bearings Bradley commenced working with his bonds. He was a man of powerful physique, and as from the first he had been imbued with a belief that the fiber ropes were too weak to hold him, he worked on with a firm conviction that sooner or later they would part with his strainings. 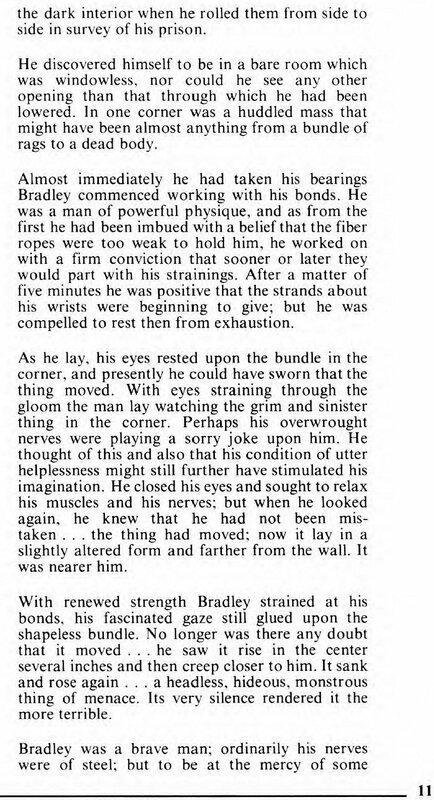 After a matter of five minutes he was positive that the strands about his wrists were beginning to give; but he was compelled to rest then from exhaustion. As he lay, his eyes rested upon the bundle in the corner, and presently he could have sworn that the thing moved. With eyes straining through the gloom the man lay watching the grim and sinister thing in the corner. Perhaps his overwrought nerves were playing a sorry joke upon him. He thought of this and also that his condition of utter helplessness might still further have stimulated his imagination. He closed his eyes and sought to relax his muscles and his nerves; but when he looked again, he knew that he had not been mistaken . . . the thing had moved; now it lay in a slightly altered form and farther from the wall. It was nearer him. With renewed strength Bradley strained at his bonds, his fascinated gaze still glued upon the shapeless bundle. No longer was there any doubt that it moved ... he saw it rise in the center several inches and then creep closer to him. It sank and rose again ... a headless, hideous, monstrous thing of menace. Its very silence rendered it the more terrible. unknown and nameless horror, to be unable to defend himself ... it was these things that almost unstrung him; to be able to use his fists, to put up some sort of defense, to inflict punishment upon his adversary . . . then he could face death with a smile. It was not death that he feared now ... it was the horror of the unknown that is part of the fiber of every son of woman. Closer and closer came the shapeless mass. Bradley lay motionless and listened. What was that he heard! Breathing? He could not be mistaken . . . and then from out of the bundle of rags issued a hollow groan. Bradley felt the hair rise upon his head. He struggled with the slowly parting strands that held him. The thing beside him rose up higher than before and the Englishman could have sworn that he saw a single eye peering at him from among the tumbled cloth. For a moment the bundle remained motionless . . . only the sound of breathing issued from it, then there broke from it a maniacal laugh. 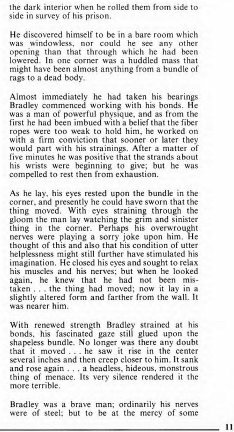 Cold sweat stood upon Bradley's brow as he tugged for liberation. He saw the rags rise higher and higher above him until at last they tumbled upon the floor from the body of a naked man ... a thin, a bony, a hideous caricature of man, that mouthed and mummed and, wabbling upon its weak and shaking legs, crumpled to the floor again, still laughing . . . laughing horribly. 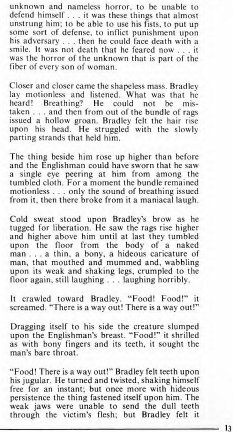 It crawled toward Bradley. "Food! Food!" it screamed. "There is a wav out! There is a wav out!" Dragging itself to his side the creature slumped upon the Englishman's breast. "Food!" it shrilled as with bony fingers and its teeth, it sought the man's bare throat. "Food! There is a way out!" 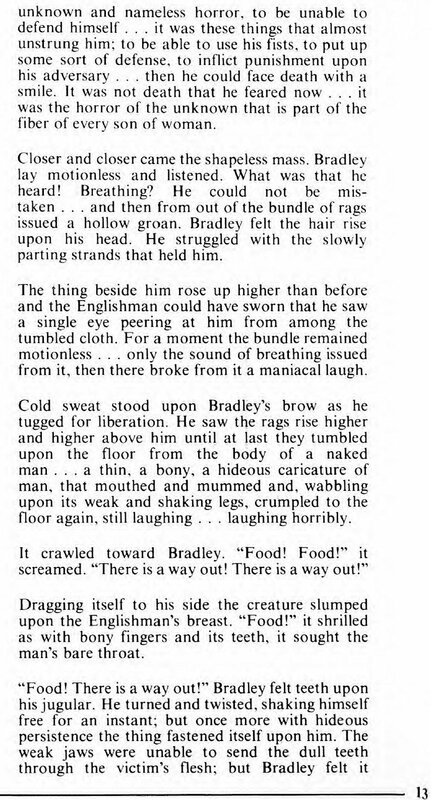 Bradley felt teeth upon his jugular. gnawing, gnawing, gnawing, like a monstrous rat, seeking his life's blood. 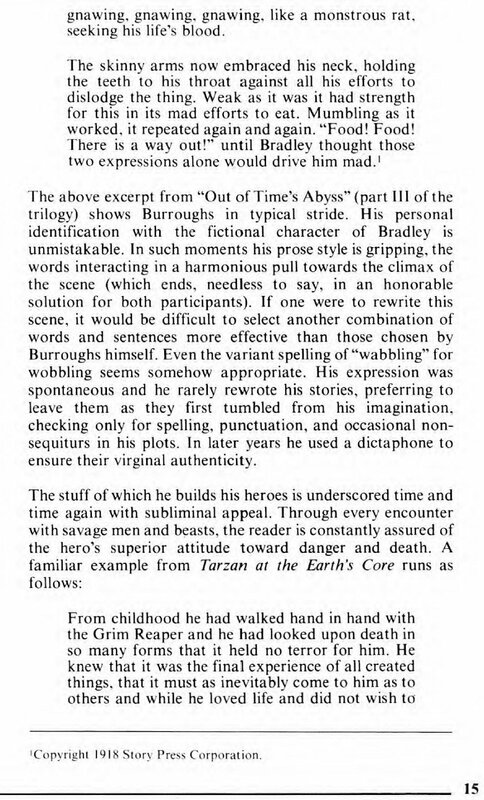 The above excerpt from "Out of Time's Abyss" (part III of the trilogy) shows Burroughs in typical stride. His personal identification with the fictional character of Bradley is unmistakable. In such moments his prose style is gripping, the words interacting in a harmonious pull towards the climax of the scene (which ends, needless to say, in an honorable solution for both participants). 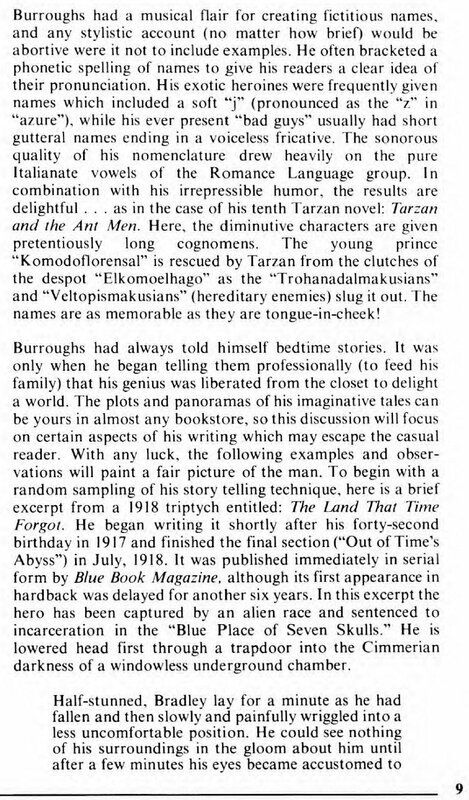 If one were to rewrite this scene, it would be difficult to select another combination of words and sentences more effective than those chosen by Burroughs himself. Even the variant spelling of "wabbling" for wobbling seems somehow appropriate. His expression was spontaneous and he rarely rewrote his stories, preferring to leave them as they first tumbled from his imagination, checking only for spelling, punctuation, and occasional non-sequiturs in his plots. In later years he used a dictaphone to ensure their virginal authenticity. 1Copyright 1918 Story Press Corporation. attacks Burroughs' anti-German sentiments in Tarzan the Untamed. Seeing that death, a necessary end. 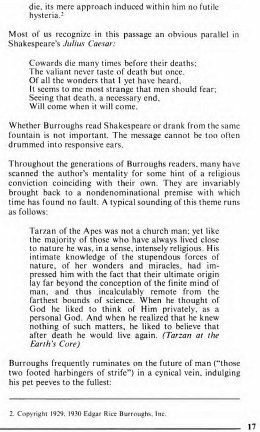 Whether Burroughs read Shakespeare or drank from the same fountain is not important. The message cannot be too often drummed into responsive ears. 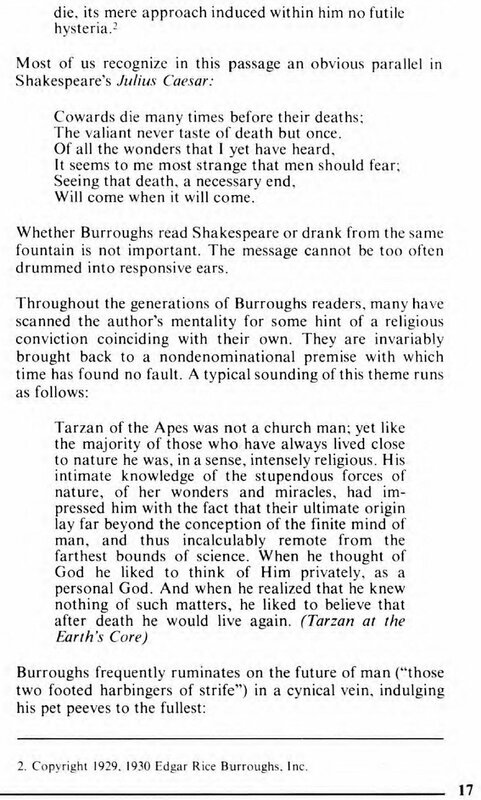 Tarzan of the Apes was not a church man; yet like the majoritv of those who have always lived close to nature he was, in a sense, intensely religious. His intimate knowledge of the stupendous forces of nature, of her wonders and miracles, had impressed him with the fact that their ultimate origin lay far beyond the conception of the finite mind of man. and thus incalculably remote from the farthest bounds of science. 2. Copyright 1929. 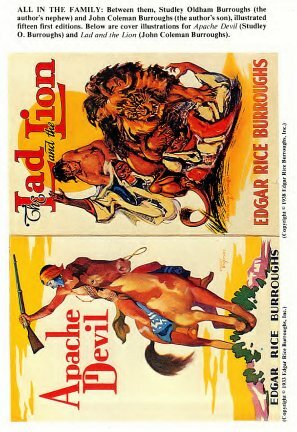 1930 Edgar Rice Burroughs. 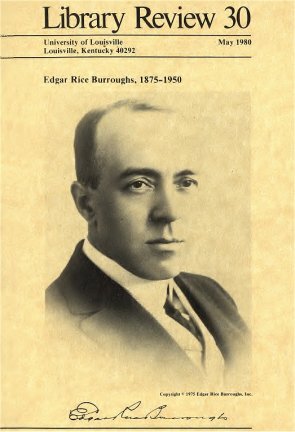 Inc.
and John Coleman Burroughs (the author's son), illustrated fifteen first editions. and Lad and the Lion (John Coleman Burroughs). Perhaps, thought Gridley, in nature's laboratory each type that had at some era dominated all others represented an experiment in the eternal search for perfection. The invertebrate had given way to fishes, the fishes to reptiles, the reptiles to the birds and mammals, and these, in turn, had been forced to bow to the greater intelligence of man. What would be next? 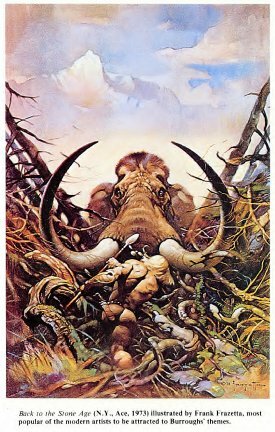 Gridley was sure that there would be something after man, who is unquestionably the Creator's greatest blunder, combining as he does all the vices of preceding types from invertebrates to mammals, while possessing few of their virtues. What will not one do to have one's curiosity satisfied, especially if one happens to be a young and beautiful girl and the object of one's curiosity an exceptionally handsome young man? Skirts may change, but human nature never. They knew that outside upon the ledge the warriors were sitting in a great circle and that there would be much talking and boasting and argument before any decision was reached, most of it unnecessary, for that has been the way with men who make laws from time immemorial — a great advantage, however, lying with our modern lawmakers in that they know more words than the first ape-men. most popular of the modern artists to be attracted to Burroughs' themes. Occasionally the public is amazed by the sudden appearance of a new talent in the form of an individual of little or no previous training, yet whose command of his art suggests a lifetime of preparation. The Metropolitan Opera Company makes such a claim for its former baritone Leonard Warren. 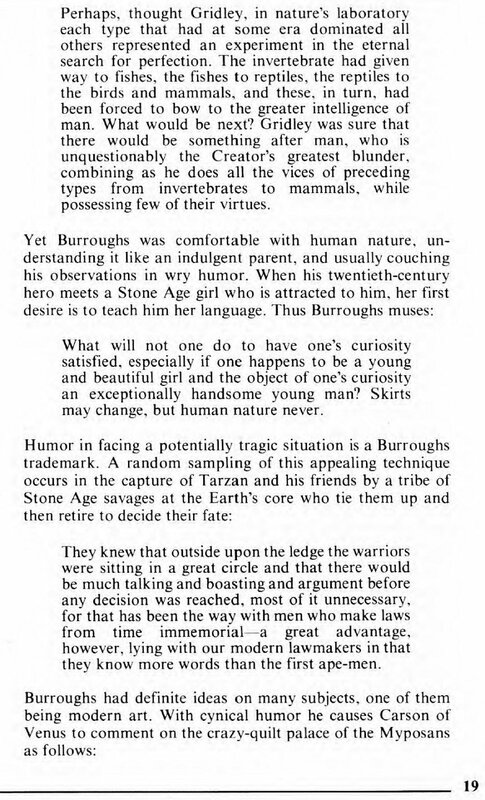 Burroughs fits this description ideally. 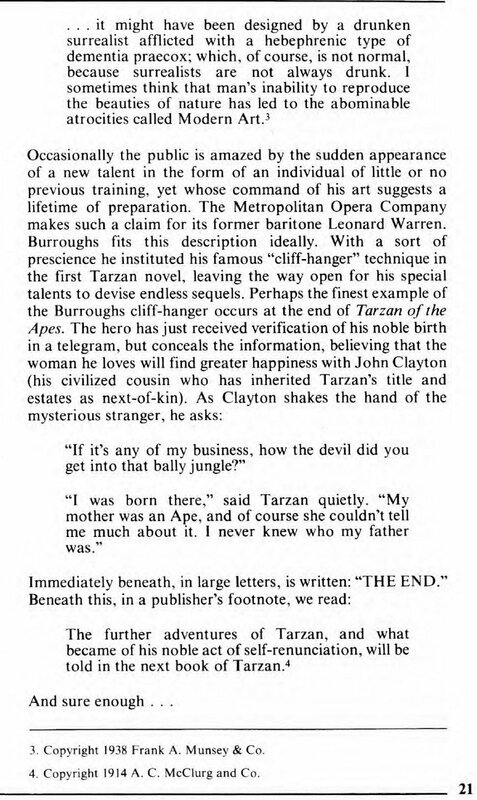 With a sort of prescience he instituted his famous "cliff-hanger" technique in the first Tarzan novel, leaving the way open for his special talents to devise endless sequels. "If it's any of my business, how the devil did you get into that bally jungle?" 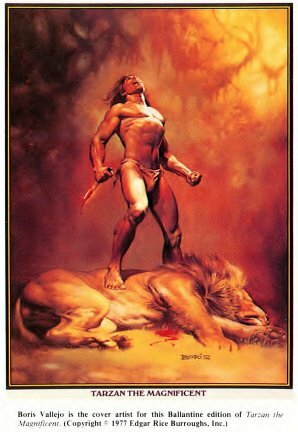 "I was born there," said Tarzan quietly. "My mother was an Ape, and of course she couldn't tell me much about it. I never knew who my father was." 4. Copyright 1914 A. C. McClurg and Co. There has always been a prevailing westerly wind in the publishing business which whispers to us that the works of all popular writers are ephemeral and hardly worth saving. When posterity alters this concept by producing exceptions the bookdealers have a field day! 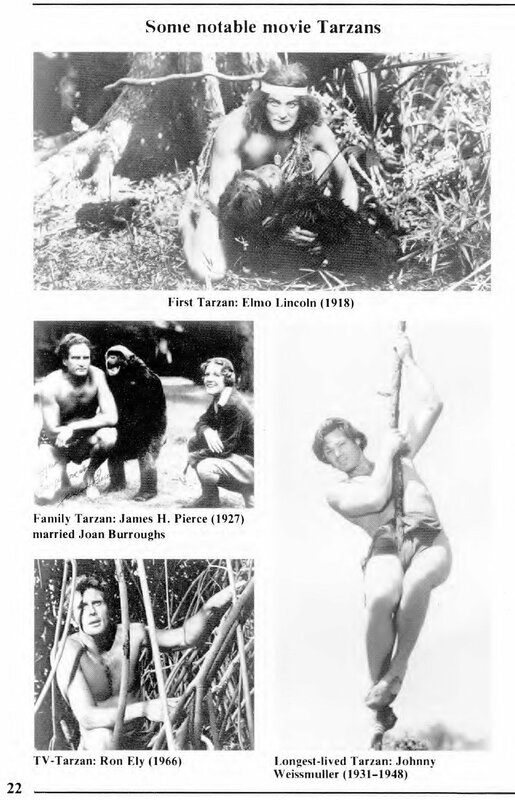 The highest recorded price ever paid for a first hardcopy edition of Tarzan of the Apes was $3,600 in 1979. (Dickens, Milton, even Shakespeare rarities may still be got for less.) What does this mean? 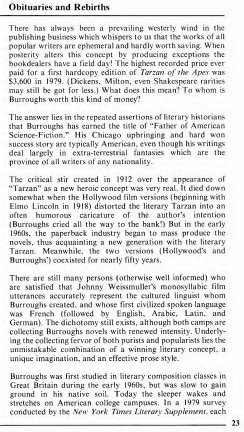 To whom is Burroughs worth this kind of money? 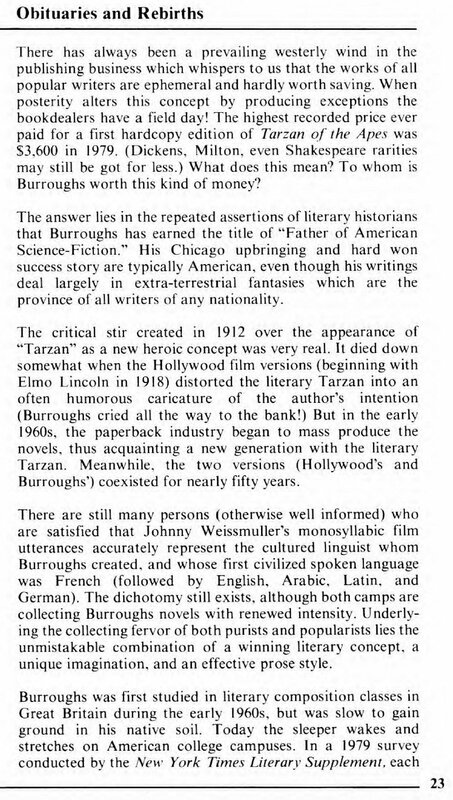 The answer lies in the repeated assertions of literary historians that Burroughs has earned the title of "Father of American Science-Fiction. " His Chicago upbringing and hard won success story are typically American, even though his writings deal largely in extra-terrestrial fantasies which are the province of all writers of any nationality. 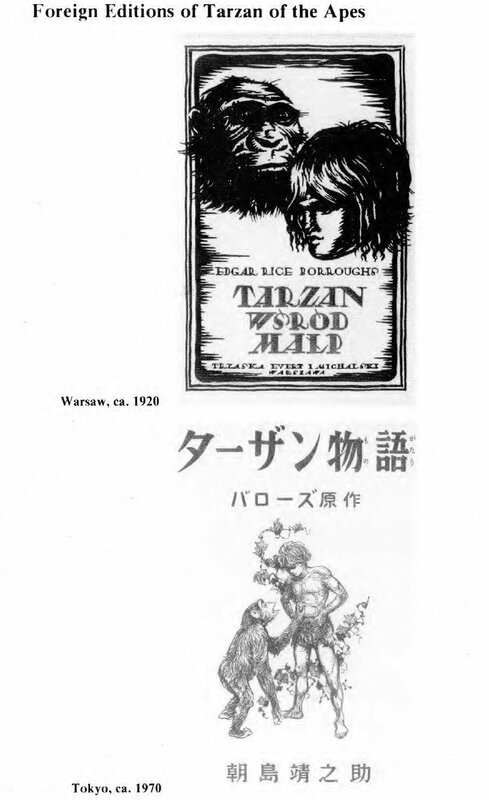 But in the early 1960s, the paperback industry began to mass produce the novels, thus acquainting a new generation with the literary Tarzan. Meanwhile, the two versions (Hollywood's and Burroughs') coexisted for nearly fifty years. There are still many persons (otherwise well informed) who are satisfied that Johnny Weissmuller's monosyllabic film utterances accurately represent the cultured linguist whom Burroughs created, and whose first civilized spoken language was French (followed by English, Arabic, Latin, and German). The dichotomy still exists, although both camps are collecting Burroughs novels with renewed intensity. Underlying the collecting fervor of both purists and popularists lies the unmistakable combination of a winning literary concept, a unique imagination, and an effective prose style. member of a panel of literary critics was asked to name his personal candidate for the most neglected American writer of the twentieth century. Burroughs was on the list. Regardless of how the tide may turn in years to come, the University of Louisville Library will remain a unique repository for a unique writer . 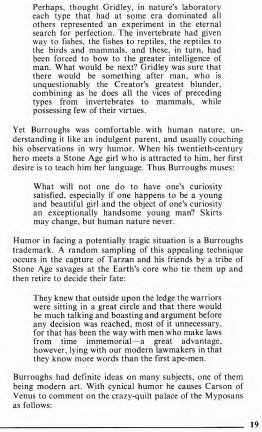 . . the incomparable king of dreams, Edgar Rice Burroughs. 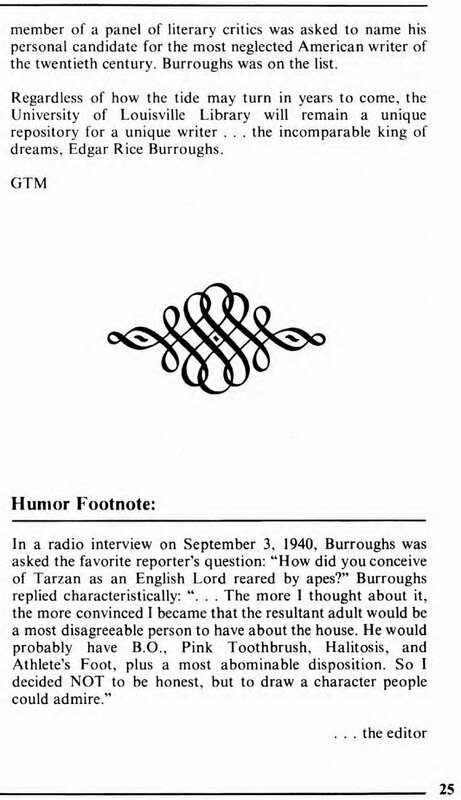 In a radio interview on September 3, 1940, Burroughs was asked the favorite reporter's question: "How did you conceive of Tarzan as an English Lord reared by apes?" 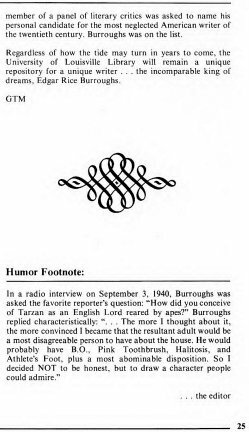 Burroughs replied characteristically: ". . . The more I thought about it, the more convinced I became that the resultant adult would be a most disagreeable person to have about the house. He would probably have B.O., Pink Toothbrush, Halitosis, and Athlete's Foot, plus a most abominable disposition. So I decided NOT to be honest, but to draw a character people could admire.